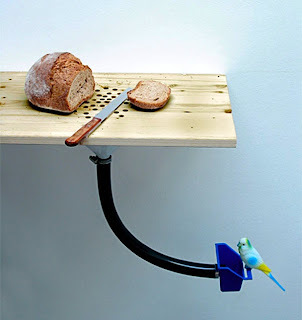 Curro Claret designed this DIY combo of a breadboard and birdfeeder, the simple function of which is clearly explained by the photo. So what's the verdict? Useful, perhaps - of course, it would have be installed in the right way, with the breadboard indoors and the birdfeeder outside. And possible pitfalls exist: clogs in the tube, insects or rodents crawling into the home through the tube, the air leak wasting heating or cooling energy, and so on. But the cuteness factor is through the roof - even with what appears to be a fake bird!